Oh Angelina, you just can not get any more girlier than this mouse. Actually it cracks me up, people always misspelled my name Angelina instead of Angela though I'm still not sure why. To top it off I'm pretty sure I had a lavender tutu just like Angelina's when I briefly took ballet lessons but I quickly learned I'm not really the dancing type. Regardless I think every little girl dreams of a few things growing up, being a princess, owning a unicorn, and being a dancer. I still dream of two of the three.. heh. Angelina fans will absolutely love this dvd but really it shines as an introduction to Angelina! Angelina has just moved and has found herself in a new home and a new school. She has to adjust to her new surroundings, something I know about all too well, and a new school, teachers, and friends! I think every little kid, and adult, has some fears of being in a new place and new people. Seeing Angelina adapt and thrive is a great lesson for any child! Plus who can resist a mouse in a tutu? What is really unusual about this dvd is there are no bonus episodes from other Hit Entertainment characters. Though it makes up for it in the fact that all the episodes you get are just all about Angelina. 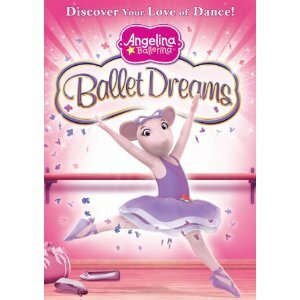 Angelina Ballerina : Ballet Dreams is available right now and you can pick up your copy on Amazon !